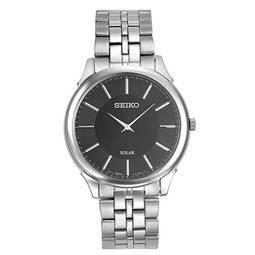 Seiko SUP865 mens Core solar black dial steel bracelet power reserve watch is offered, in a polished solid stainless steel case. This model is made in dimensions of 39mm across. This watch has a fixed bezel and a textured push/pull main crown. Seiko SUP865 is equipped with a silver stainless steel bracelet. Securing the bracelet is a fold over push button clasp made in stainless steel. The dial is black and it features tasteful sized, index hour markers and silver tone luminous dauphine shaped hands for optimum legibility. Seiko SUP865 also features a 12-month power reserve once fully charged function. This timepiece has a hardlex crystal for scratch resistance. Driving this fine watch is Japanese made V115 solar quartz mechanism. The water resistance comes in at 30 meters. 3 year limited warranty.